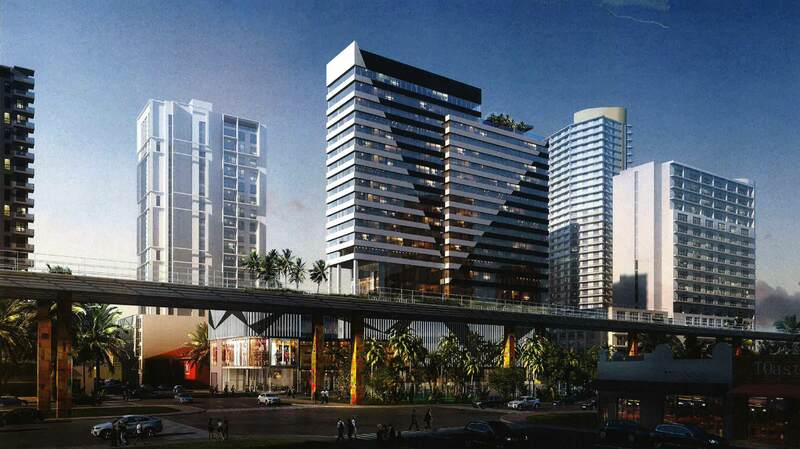 The developers of a hotel and retail project across from Brickell City Centre filed for a construction permit last week. The project is named AC Miami Brickell, records show. It is set to replace the former El Eden motel, which has been demolished. The project has already been through review by Planning & Zoning, including a vote by the Urban Development Review Board. Tony Cho and Robert Finvarb are the developers. It will be vastly taller than what was there before. Well then in that case, they could’ve left what was there before. Taller that that?.. you mean like the 22 stories they’re building it? no, somewhere between 2 and 22. So since it’s going to be 22 stories, what’s your gripe? wish it had more parking. Sheesshh, give it a break.. next you’ll be wanting a Walmart. Wait! What?? El Eden was demolished?? Damn! That is where I lost my virginity back in High School. Best 50 bucks I ever spent. No joke, that place had great memories for me. Absolutely nothing of value was lost. Waste… no new construction in brickell should be under 400 ft…you want low rises, go to Midtown where the FAA will keep you short. The FAA doesn’t keep Midtown short, zoning does. 1000ft+ is allowed in Dwntwn and Brickell. FAA would not approve 1000ft+ in Midtown. Direct path of flights. That doesn’t that a height like 375ft is short. That doesn’t mean that a height like 375ft is short. Keep the density coming! ? And your point? Something better than nothing is a sad way to live, son. Go big or go home. Love the project for the location. West Brickell is more affordable and will be a very popular area within a decade. I bet it’ll have more locals/full time occupants than other parts of Brickell, thus increasing the density. At least until Miami develops high paying jobs that give locals the opportunity to afford the insane rents to the east. The highest salaries in Miami are earned by residents of Brickell. The highest wages are paid by employers in Brickell. It is a hotel. Why would you have full time occupants. Another Arquitectonica beauty!!! it so too 2-dimensional with its boring triangles, curves, circles, drawn on all parking structures and balconies. Are you kidding?.. for Arquitectonica, this is a masterpiece! I told them to wait for your design!!! Starlight crack den is next hopefully…what an eye sore!! Bring back El Eden. I had very good times there! Sorry, it’s gone. But you can take your money and recreate it somewhere. Clarification Q – Is the rooftop bar still planned or was it left out of the final plans?? If they’re at Starlite East, they’re not high end. Trying to understand the reason for retail in an area that’ already chock full of retail.